We have been reviewed and interviewed by the media on many occasions, includes features on various news channels and TV shows, such as CNN, CBS2, and KCAL9, and Dr. Drew, as well as in media outfits such as the Associated Press, USA Today, Dailybreeze.com, Get up to date with latest news here. 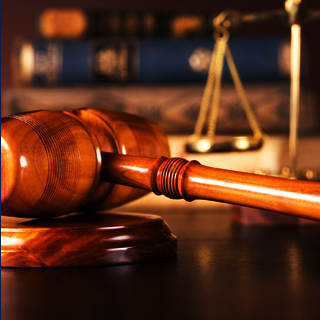 Over the years, Okabe & Haushalter has come to be recognized as an aggressive and successful criminal defense firm, having garnered countless satisfactory case results. Due to our success, we have been reviewed and interviewed by the media on many occasions. 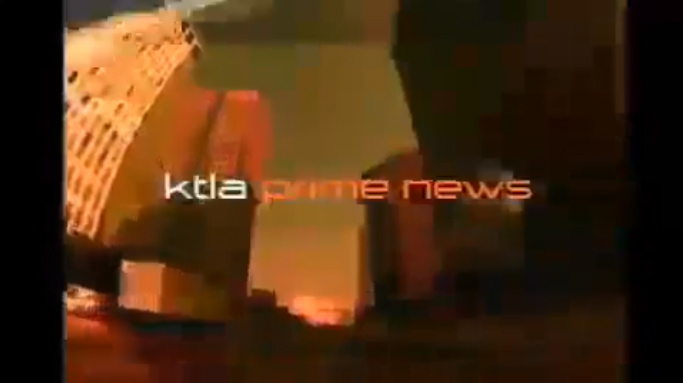 This includes features on various news channels and TV shows, such as CNN, CBS2, and KCAL9, and Dr. Drew, as well as in media outfits such as the Associated Press, USA Today, Dailybreeze.com, and Newsweekmagazine. The latter recently named our firm a Leader in Criminal Defense in their October 15, 2012 edition. 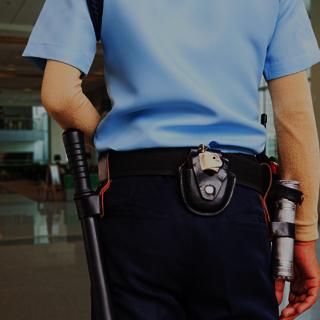 Without a doubt, Okabe & Haushalter has what it takes to defend you from any kind of criminal charges. Call today or fill out our case evaluation form to schedule an appointment with a Chicago criminal defense lawyer who will fight aggressively on your behalf. Waiting to contact a lawyer can only damage your chances of obtaining a dismissal of your charges. 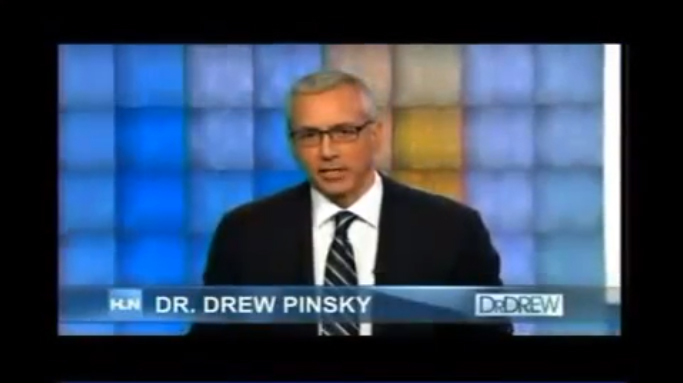 Attorney Mark Haushalter comments on the consequences on the Dr. Drew Show. 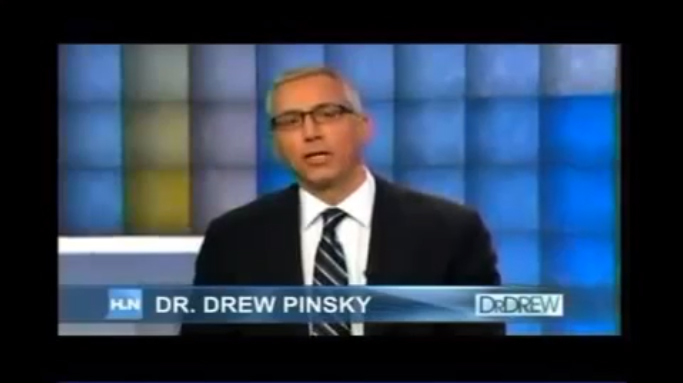 Attorney Mark Haushalter discusses the arrest of Nicolas Cage on the Dr. Drew Show. 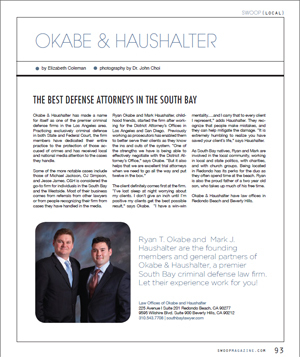 Okabe & Haushalter has made a name for itself as one of the premier criminal defense firms in the Los Angeles area. 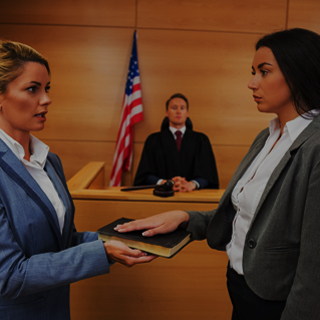 Practicing exclusively criminal defense in both State and Federal Court, the firm members have dedicated their entire practice to the protection of those accused of crimes and has received local and national media attention to the cases they handle. Attorney Mark Haushalter was recently interviewed by KTLA in response to allegations that Jesse James, the famed owner of West Coast Choppers and another unidentified man, attacked him a member of the paparazzi while filming outside of the shop. Click Logos below for articles from CNN and People Weekly. The attorneys at Okabe & Haushalter are representing members of the paparazzi that were wrongfully attacked on public property by the security staff where the popular TV show “The Bachelor” was being filmed. Learn more about the story by clicking the play button on the video below. Read Okabe & Haushalter’s feature article in Swoop Magazine The law firm of Okabe & Haushalter has handled a lot of high-profile criminal defense cases that you’ve probably seen on the news. They were on the O.J. Simpson case. They’ve worked on organized crime and other federal cases. But these Redondo-based defense attorneys aren’t in it for the glory. Ryan T. Okabe is one of the founding members and a general partner in Southern California’s Premier Criminal Defense Firm of Okabe and Haushalter. 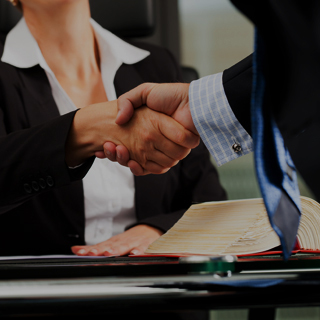 His experience with both sides of the adversarial system provides his clients with unparalleled advantages in obtaining the best possible legal defense. Mr. Okabe has successfully tried a wide variety of cases and his dedication to his clients, attention to detail, and involvement in high profile cases has made him one of the top criminal defense attorneys in Los Angeles County. 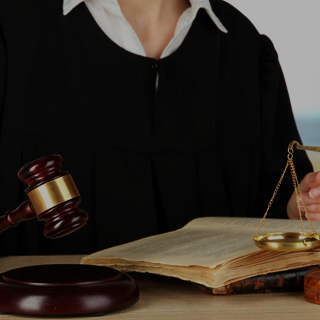 Located in Redondo Beach, Mr. Okabe handles all California and Federal criminal cases. Jamel Stanfield stepped out the back door of the Torrance Transit bus at a Carson stop to make sure his younger brother was boarding safely. NORTHRIDGE Two 18-year-old suspects were identified Friday in the stabbing of a 33-year-old Northridge man who was found dead in a Porter Ranch park. By KEN RITTER, Associated Press WriterLAS VEGAS – Lawyers for three codefendants in the O.J. Simpson armed robbery case lost a bid Thursday to force prosecutors to turn over audio recordings made by the man who arranged the meeting between the former football star and two memorabilia dealers. By Kathleen Hennessey, Associated Press WriterLAS VEGAS  A key witness has turned over hours of audio recordings in the O.J. Simpson armed robbery and kidnapping case, his lawyer said Saturday. The two-man firm of Mark Haushalter and Ryan Okabe are the attorneys for Tom Riccio, the man who taped the incident in the hotel room. For most attorneys, touting your stuff in the national spotlight is the ultimate publicity dream. LAS VEGAS A key witness has turned over hours of audio recordings in the O.J. Simpson armed robbery and kidnapping case, his lawyer said Saturday. Police have confiscated hours of audio recordings from a witness in the O.J. Simpson armed robbery and kidnapping case, a lawyer said Saturday. (CBS) LOS ANGELESLas Vegas police detectives Friday afternoon raided the Alhambra home of memorabilia dealer Tom Riccio in connection with the O.J. robbery case. Stephen Kay retired after years of murder trials, including the prosecution of Charles Manson, but now he’s coming out of retirement to handle municipal misdemeanors. He was a key prosecutor in the Charles Manson family murder trials.